Electrocraft engineer Ed Swisher, left, discusses job opportunities in the manufacturing world with Gallia Academy High School students. 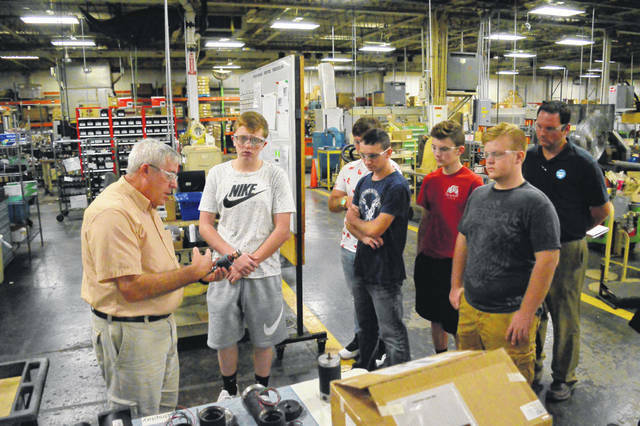 GALLIPOLIS — Gallia Academy High School students gathered at the Gallipolis ElectroCraft to discuss the potential of American manufacturing and the career opportunities that can potentially come with it in recognition of National Manufacturing Day. Students were split into groups and guided through the factory facility while discussing the types of careers found in ElectroCraft. ElectroCraft engineer Ed Swisher led a tour of some students through the building and encouraged them to consider manufacturing as a career path in a variety of ways. Whether a student wished to go to college and obtain an engineering degree or attend a trade school to get a certificate in machining, there were paths for a future. The Gallipolis ElecroCraft employs over 180 individuals. Globally ElectroCraft is known as a sub-fractional horsepower and drive manufacturing company. ElectroCraft products are used in the military, medical, automotive and restaurant industries. Dean Wright can be reached at 740-446-2342, ex. 2103.